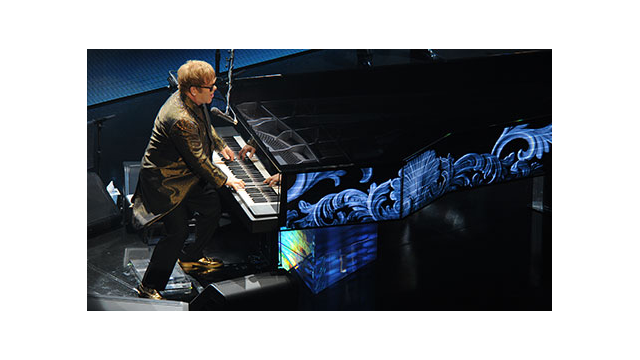 ARLINGTON, VA; SEPTEMBER 25, 2013 – PBS today announced the world television premiere of ELTON JOHN IN CONCERT, a new special featuring the legendary musician in an exclusive and intimate performance taped in the beautiful surroundings of the BBC’s famous Radio Theatre in the heart of West London. The concert special showcases the multi-Grammy Award-winning superstar performing songs from his new album, The Diving Board, mixed with classic songs from his extensive repertoire of hits. Originally broadcast live on BBC Radio 2, the UK’s most listened to station, ELTON JOHN IN CONCERT premieres Saturday, October 5, 8:00 p.m. ET (check local listings) on PBS. Produced by T-Bone Burnett, The Diving Board is Elton John’s first solo studio album in seven years, and features 12 new songs written with longtime lyricist Bernie Taupin, as well as three piano interludes composed by John. “It’s the simplest and most piano-driven record I’ve ever made,” John told BBC Radio 2 in an interview on September 11, 2013, the day of the concert. Sir Elton Hercules John, CBE, is one of the most highly acclaimed and successful solo artists of all time. He has achieved 35 gold and 25 platinum albums, has sold more than 250 million records worldwide, and holds the record for the biggest selling single of all time. Over the five decades since his career began in 1969, John has played more than 3,000 concerts worldwide. John is the third most successful artist in the history of the American charts, behind only Elvis Presley and the Beatles. He has had 56 top 40 singles in the United States, a total second only to Elvis Presley. He achieved seven #1 albums in the three-and-a-half-year period from 1972 to 1975 — a period of concentrated success surpassed only by the Beatles.